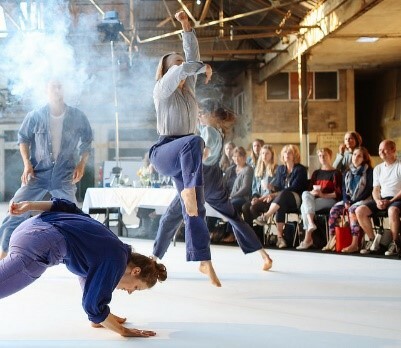 The Dance Movement presented Theo Clinkard’s Double Bill: Chalk and Of Land and Tongue in May 2015 as part of its ongoing dance audience development plan, which sees TDM presenting professional dance works in partnership with Farnham Maltings. The production and presentation of professional companies is integral to the Company’s belief in bringing high quality, innovative dance to the community. We learnt that of Clinkard’s 2014-2015 tour dates, The Dance Movement drew the largest audiences outside of London. This might regarded as the result of over ten years building an audience through establishing relationships with people in our community. Of Land and Tongue was presented twice; firstly, to a specially invited audience of GCSE, A-level and degree students from the local area, and secondly, as an open event to the public. 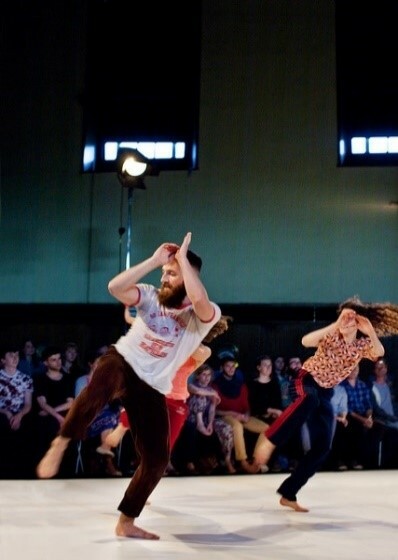 Both performances included a question and answer session to enable audiences to enter into an informal discussion with the choreographer and dancers allowing them insight so that they might further understand the work. Schools that attended the educational performance included Digital and Film Screen Art students from The University of Creative Arts: Farnham, Farnborough Technology College, Collingwood College and West Thames College. The cost of the project was £2500 which included the fee to Clinkard’s company, presentation fees and management hours to plan and manage the show.